So, another week, another non-weigh-in. I hope to be back on form next week. Until then, you'll have to settle for a reflection on the past week, which has been enlightening in some ways. Last week's post was frought with angst at the end. The prospect of not knowing what I weigh and whether or not I was losing sent me into a tailspin. And the fact that my scale just decided to mess with me and throw up numbers beginning with 3 just made it worse. Upon reflection of last week's post, however, I noted that it was time to go back to the doctor and get some help. I recognized the signs. And while they weren't as bad as previous times, I knew it was imminent. Yep, that old companion depression was back. And it's no wonder, to be honest. There's been a lot going on recently - transitions either taking place or on the horizon - that would be overwhelming on a bright, warm and sunny day. Add to it the dark, cold, damp, and depressing winter days of Northern Ireland and it's a recipe for a prescription of anti-depressants. The rest of the year, I have the tools to deal with it (for the most part). The rest of the year, I can see the irrationality and nip it in the bud. But at times like this, I just don't have the capacity. The strength isn't in me to do that and keep up with the pressures of everyday life. I need help. It's a low dose, but it's just enough to alter the chemicals in my brain to get over the hump that is winter while still allowing me to deal with the real issues at hand. Last time (2009), it topped me up enough that I was able to get by last winter without them. But it seems as if my stores are depleted once again, so it was time. If it weren't for the Ph.D dissertation writing pressures on this year as well, I probably could have ridden it out, but I just can't afford the couple months of dormancy that riding it out would have required. Now I've been on them for about 5-6 days and my world is slowly starting to straighten again. What a relief! It's humbling to note, however, that despite my doubts (fueled by the depression, no less) about my own value, capabilities and contributions to the world, I am surrounded by a whole host of people who cheer me on and who believe that what I have set out to do will be accomplished. Despite my temptation to withdraw, the value and support of the community which surrounds me (both in real life and online) is strong. You hold me up. You remind me of why I'm doing this. You show me that what I'm doing may not be as worthless as my depression tells me it is. It reminds me of the scene in Spiderman 2 where he's just battled Dr. Ock and saved a train-load of people. But the battle has taken its toll on Spiderman and he loses his mask, slumps down and is carried by the people he's just saved to safety and restoration. Messiah-complexes aside, this scene makes me cry every time as it shows me that even the strongest among us need to be cared for and supported, that sometimes they just can't do it all and need to let their guard down, let people see who they really are and slump for a while. I have no idea if I've lost or gained this week. And I'm trying to be ok with that. I'm trying to remember that I am doing this for more reasons than just to see a lower number on a bathroom gadget. But I have hearty admiration for folks who go through this journey without the scale and are still successful. I have no idea how they do it. 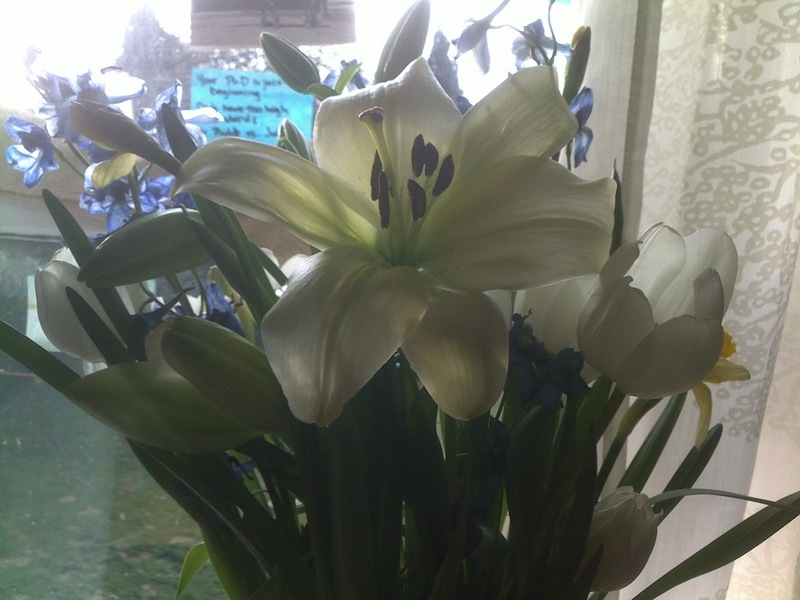 With the last one, I bought myself some flowers to remind me that spring IS coming. Winter is not the end and does not get the last word. Life does return. Plus, you can't be depressed when tulips, daffodils and lilies are near. What are your strategies in dealing with times when you are down? What do you do that gives you life and hope? Who holds you up when you can't stand on your own? Yes, even superheroes need help every once in a while. You're certainly not alone, and not unique in this situation. I will fully admit I've started meeting with a therapist AND psychiatrist who is seeing what kind of relief I can get from the never-ending cycle of depression and anxiety. This winter time is the worst anyway, so that adds to everyone's sadness this time of year. And don't stress about the scale. So what if you don't know your weight this week? You'll know it soon enough and keep pushing on as always. Hang in there! Hang in there! Good for you for recognizing the signs and taking care of yourself. I awarded you a blogger award! Check it out on my site.